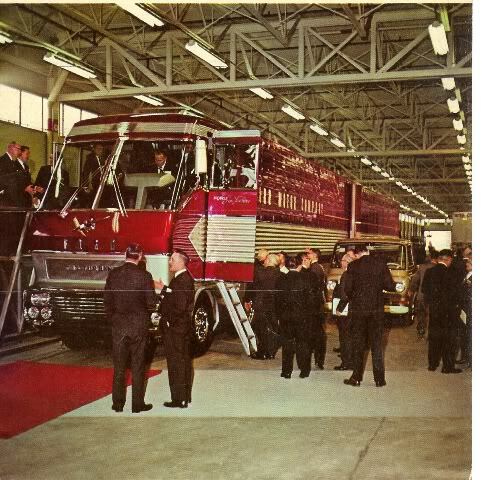 (Editor’s note: There was some discussion on a FB group about these trucks the other day so I thought we should let people know that there was some wild development work being done by OEMs in the 1960s in the realm of big trucks!) By the middle 1960s, the interstate highway system was rapidly expanding across the country, tying the whole nation together with high speed roads that would change lots of things about American life. In particular would be huge changes to commerce between states and specifically the movement of goods. Without direct highways, truckers were taking sinuous roads that were not sufficient for trucks to move at advanced speeds or to cover large amounts of distance each day. By the middle 1960s, huge progress had been made on the project and companies like Ford and General Motors were trying to “see” the future and how these new roads would change vehicle design. Being that both companies had robust military contracting wings and those engineers and researchers had been working on gas turbine engines to power tanks, personnel carriers, and other equipment for years, it only makes sense that the technology would start to bleed over onto the roads of the country at some point. 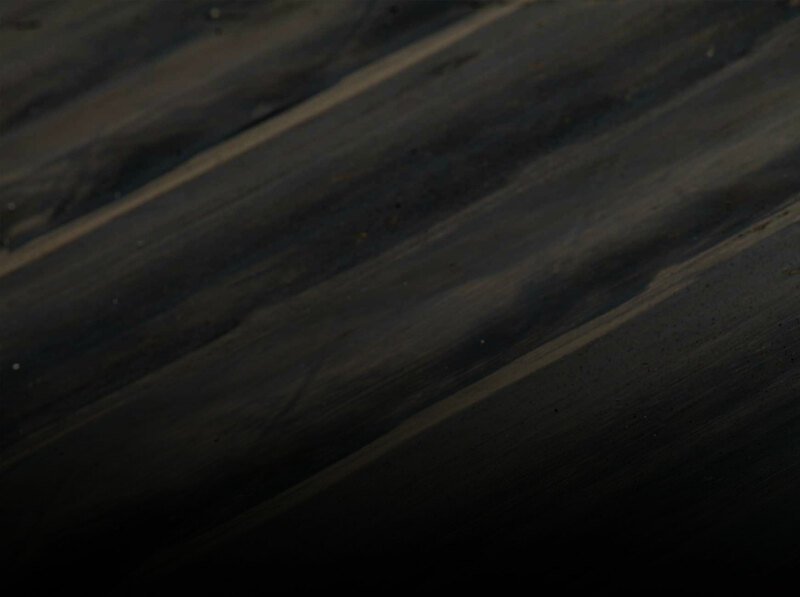 These light and powerful engines piqued the interest of engineers working on cars and trucks. 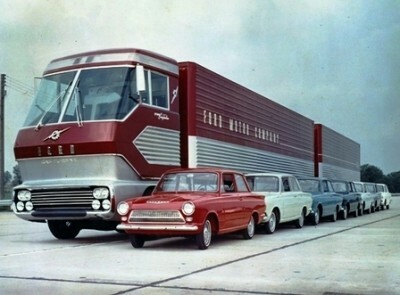 Lots of people remember the famous Chrysler turbine cars, but far fewer remember Chevrolet’s Turbo Titan III and Ford’s “Big Red” which were fully operational big rigs that both debuted in the mid-1960s as an advanced look at the trucks which would soon fill the freshly built highways of tomorrow….but they never did. 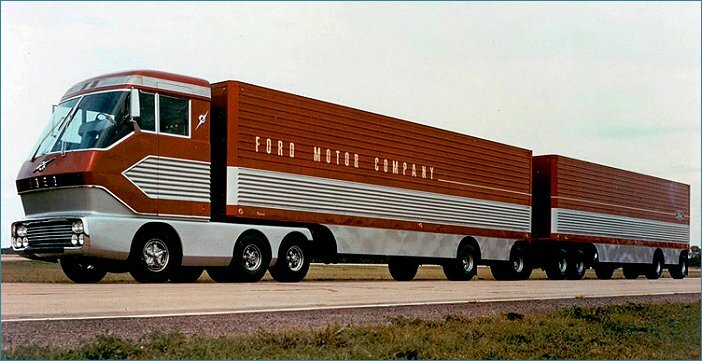 While companies like Kenworth and others worked on gas turbine powered big rigs all the way back in the early 1950s and companies like Leyland worked on them over in England, the two most wild and impressive rigs (in our opinion) came from Ford and General Motors. Both debuted at about the same time but they were drastically different in design and size. 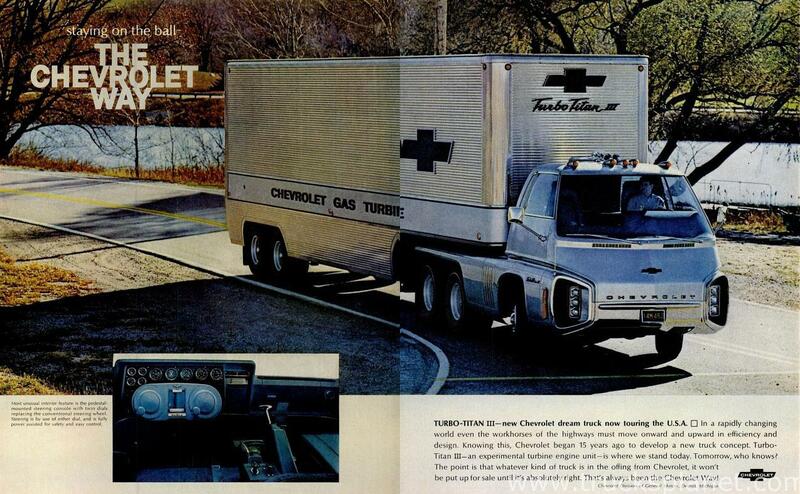 We’re going to start small and go big here with Chevrolet’s Turbo Titan III, which hit the press as a working unit in 1965 and was traversing the country and appearing at events like the World’s Fair and other places soon thereafter. The Turbo Titan III was the biggest in a line of gas turbine powered vehicles from General Motors with a gross vehicle weight of a shade over 76,000lbs loaded. 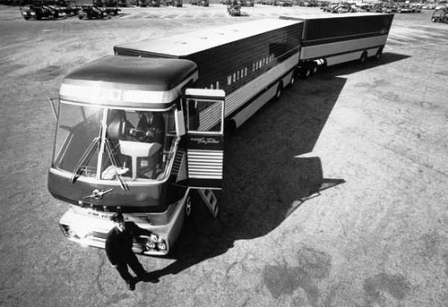 With a total length of 50-feet when pulling its custom built 40-foot stainless steel trailer, the cab of the truck was unlike anything the world had seen before or since. As you will see in (some of) the photos below, there were three headlights stacked vertically inside the huge air intakes for the turbine engine. The cab had a pretty low roof and generous windows to promote good vision for the driver. The side windows were hinged at the top and hinged out rather than rolling down. It was both futuristic looking and more aerodynamic (by lots) than traditional trucks of the day. But what about the power plant and drivetrain? For 15 years, GM had been working on turbine engines and the result of that work was a unit that they called the GT-309. The lightweight gas turbine engine produced a mere 280hp but a very substantial 875 lb/ft of torque at idle speed. The engine was hooked to an Allison automatic transmission by way of a custom built aluminum adapter. Also part of the equation was a “power transfer” unit which actually allowed the turbine to provide engine braking by applying a clutch when the driver was off the throttle. According to the August 1965 issue of Fleet Owner Magazine, this system worked 2-3x better than traditional systems on diesel piston engines. The gear ratio used in the rear axles was 7.17. We’re not sure what the top speed of the truck would have been but we’re guessing 70mph or so would have been in the cards. It would have been important to have a significant top speed with these trucks for their day to reinforce the idea that they were going to be dominating America’s newly minted highway system. The frame wasn’t much different than a standard truck frame then or now. It did roll on cool custom made “super singles” decades before the term would enter the popular lexicon and become frequently seen on over the road trucks. The cab was constructed of a steel frame with fiberglass panels. The headlights we told you about in the air ducts for the engine were retractible, which is why they can be seen in some photos and not in others. The interior of the truck was pretty gnarly in itself. 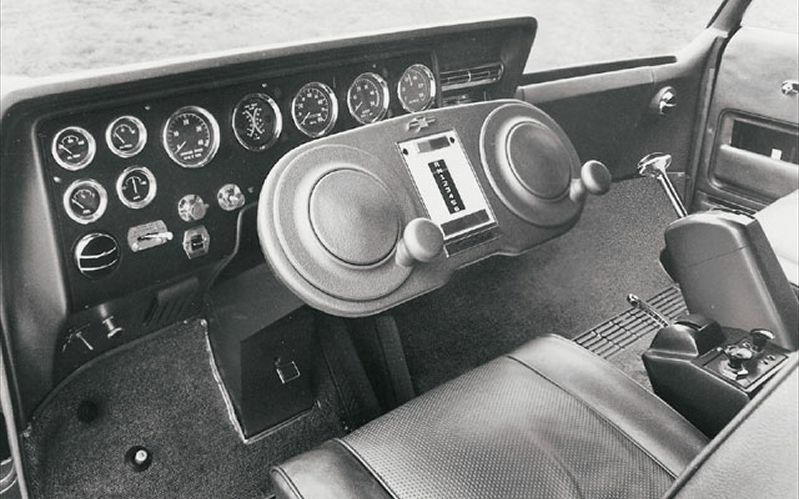 With three seats looking like they were stolen from a spacecraft in the same layout as a McLaren F1, a pair of dials used to steer the truck in lieu of a traditional steering wheel, and a shifter handle that looked like a set of wings, this was far out 1960s grooviness to its core. The dials were on a pedestal that swung out and could be adjusted to fit the driver. Operators reported that the dial steering system was OK once they got used to operating it. The truck did rack up a lot of miles before being retired. The Chevrolet project died in the water for the same reasons as everyone else’s. The expense of mass producing the engines, the fact that the EPA started hammering down on certain emissions standards (NOx was a big one that turbines would fail miserably on) and the fear that despite their coolness turbines would not be accepted by fleet managers and truck buyers. 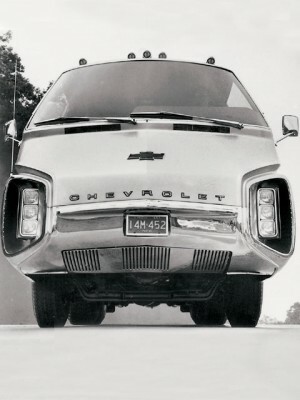 We’re not calling it a failure because GM got a lot of publicity and R&D out of the truck before it was retired. Where is it now? No one really knows. 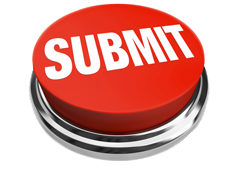 We hope someone has it! If the Turbo Titan III was the looker of the pair, Big Red is a brawny older brother. Built for virtually the same reasons that the Chevrolet was constructed, Ford chose a different path with what they were looking to test. Rather than just build a futuristic proof of concept, they built a 700hp turbine powered monster that was 92-feet long and had a GVW of 180,000lbs. 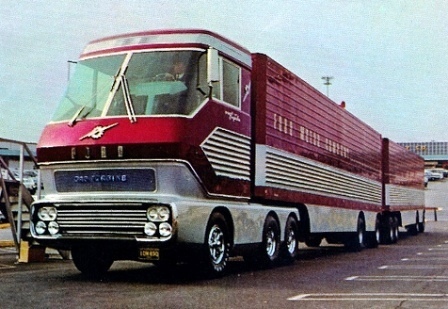 The truck was so large it required special permitting to travel through some states when it debuted at the 1964/65 World’s Fair. The engine making all of that power was a military project that Ford was involved in. Dubbed the 705, this was a gas turbine commissioned by the US military after Ford had built them a 300hp unit. The idea was to scale that engine up and test for durability, which was accomplished by driving the huge truck all over creation after the World’s Fair stint. With fuel economy hovering at a robust 2.1 MPG, each 280 gallon fill-up got the rig 600 miles down the road. Being a turbine, kerosene and gasoline were used as fuels. 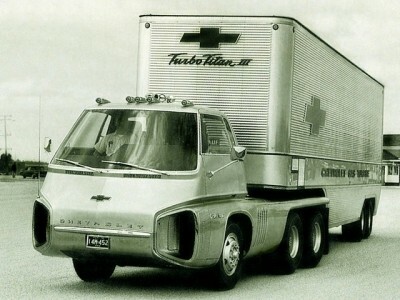 Chevrolet had hinted that they were going to try and get their truck into a commercial fleet and actually put it to work. Ford had no such plan, they literally built this thing as a giant “what if” project, which is incredible when you think about the expense involved in making this truck from scratch. One of the most awesome parts of the beat was its 78mph top speed. 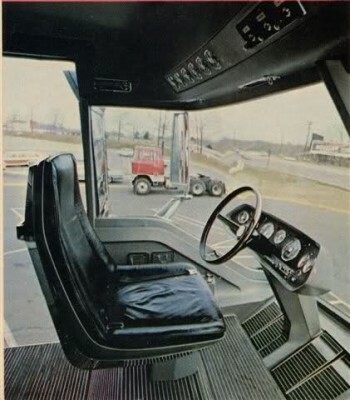 78mph in a big rig may as well have been the speed of light in the middle 1960s (excluding times when guys would put the clutch in and let the trucks coast fast enough that they’d twist the needle right off the end of the speedo. 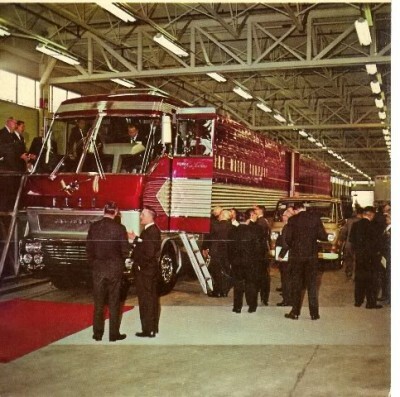 With air suspension all around and a suspended cab, the drivers that wheeled Big Red were living in a world of luxury that no trucker of that age could even really conceive. There were a total of 10 operators of the truck during its active life and everything we have read says that to a man they gave the truck glowing reviews. The cab, like the Chevy was a steel frame with fiberglass panels over it. The cab was also one of the most amazing ever designed for an actual road going truck. The ceiling height was 6’8″. Two or three men were in the truck at all times. The guys not driving could get up and move around the cab and they could even use a fold-up toilet with electronic waste incinerator so “pee stops” were pretty much a thing of the past. There was also a fridge, a “food warmer” hot and old water dispensers, and other “homey” features that would allow the truck to run virtually non-stop 24/7 between fill-ups. Believe it or not, there was a TV mounted up high with slats that prevented the driver from watching it. The off-duty man could lounge in what was basically an easy chair and take in his favorite show while resting. There were more than a couple neat innovations housed in Big Red. The truck had three redundant braking systems. 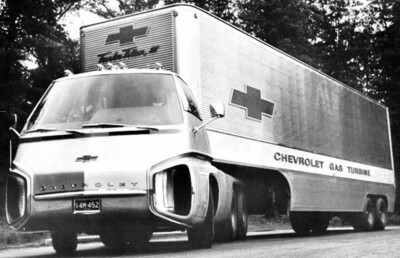 This was done because unlike the Chevy, Big Red got all of its braking at the wheels, there was no engine braking as it did not use a power transfer unit like the Titan did. It did use a super neat “supercharging” system which was a first of its kind on a turbine making less than 5,000hp. With the two stage compressor, the engine could be run on one for normal cruising and then the second one could be engaged for maximum power needed for scaling big hills or moving super heavy loads. So where is it now? No one really knows. Holman-Moody owned it for a while after Ford and the rumor is that the giant truck is sitting and slowing rotting at Ford’s proving grounds in Dearborn, Michigan. We’d sure like to know if it is still intact, no matter how weathered. GLORY VIDEO: Crank The Speakers To 11 and Watch This Screaming Z/28 Take On Sebring! Can You Imagine Owning A Car Over Fifty Years? 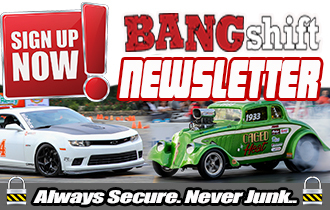 Check Out The Case Of This 1934 Ford!